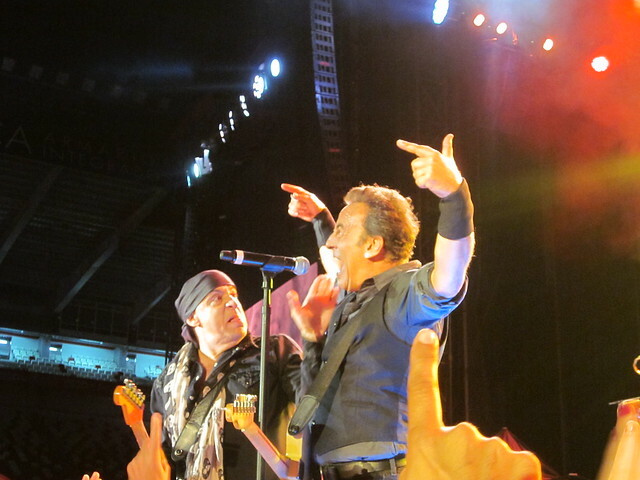 I wrote a “Notes from the Road” column for Brucespringsteen.net (can be found at: http://brucespringsteen.net/news/2013/notes-from-the-road-paris ) which I won’t repeat here. Judging by the reaction when Bruce announced the predictable choice of the “Born in the USA” album, a large part of the crowd was probably quite happy with the setlist. Then again, that can be expected when Bruce reduces his show to appeal to the lowest common denominator. This was a disappointing show, as it underscores the big issue with this part of the tour: Bruce has run out of ideas, and he is falling back on full-album performances as he is not willing to try something else. If given the opportunity, I would be quite curious to hear from Bruce whether he is performing the albums because he wants to or if he thinks the fans want them. Yes, this show was in a large stadium on a Saturday night (by Bruce’s choosing, of course) and he certainly should be playing material that can appeal to the crowd as a whole. The entire Born in the U.S.A. fully addresses that need. To add schlock such as “American Land” and “Pay Me My Money Down” (together with the indestructible “Waiting on a Sunny Day”) is simply unbelievable. 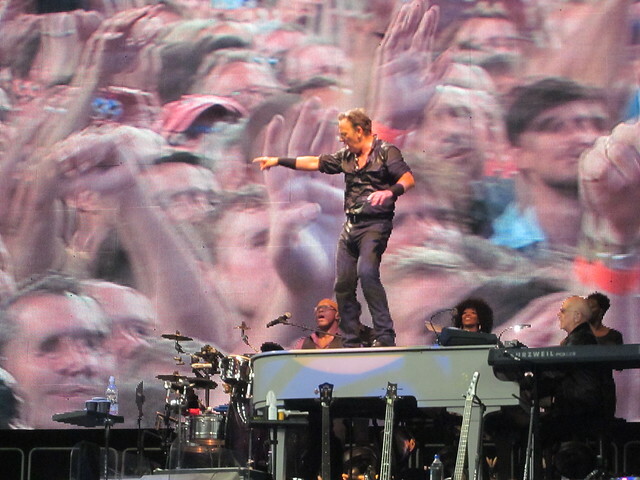 At the end of the show, prior to playing “Thunder Road,” Bruce took special note to thank his repeat customers , saying “I want to thank you guys who we see at so many shows.” The juxtaposition between that and a setlist where he couldn’t even be bothered to try moving slightly outside of his safest (a three minute version of “Lucille” doesn’t count), easiest and most over-played repertoire is inexplicable. Not every show can be a Gijon or Tuku with several choice requests and an ambitious setlist. But certainly there can be a middle ground somewhere in which Bruce makes at least a minimal effort at challenging his audience, presenting a show that addresses his current music and does not simply rehash past glories. I reviewed this show for Backstreets; review can be found there. Gijon was one of my favorite shows on the tour, in large part due to several excellent choices on the setlist. With songs from Magic, The Promise and Lucky Town, we almost hit the “missing albums” superfecta; if only something from Tunnel of Love had made it as well. It wasn’t quite a perfect set though, as the flow of the show was occasionally uneven. It was as if Bruce had all of the right songs, but just didn’t quite have them in the right order: “Radio Nowhere” should have been at the top of the show (not the encore) and instead “Travelin’ Band” should have been in the encore. “Ain’t Good Enough For You” was slightly miscast in the start of the show, and of course should have replaced “Sunny Day” instead. “Rosalita” could have worked better in the encore (or even after “Light of Day”). It made sense that Bruce would bring back “Jack of All Trades” for Spain, but it was a shame that he elected to skip “Rocky Ground,” planned to open the encore. I find it encouraging that he would consider playing the song again but it remains baffling that he’s unwilling to take a risk with anything other than the first slot of the encores. He stuck “Rocky Ground” between “Tenth Avenue” and the final song of the night in Dublin last summer, and it worked quite well there; it would have worked well there again in Gijon. One of the great joys of this show was seeing how Bruce reacted once he took the “Ain’t Good Enough For You” sign and cued the band to start, with him doing a double-take as the crowd was singing the melody back louder than the band was playing. Of course, it really shouldn’t be a surprise to Bruce anymore that the audience reacts so well to this song — they did so in Oslo, and in Turku, and now in Gijon as well. 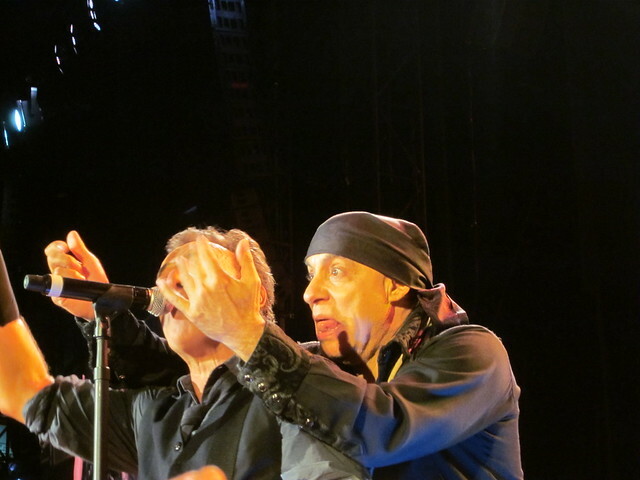 “You Can Look (But You Better Not Touch)” was a surprise, and it was a treat to see Bruce and Stevie clowning around, but also to see the reaction of Garry, who was clearly enamored of the audible choice and was grinning and hopping along as he played. It was mentioned in the Backstreets report but it bears repeating that Steve had a very good night – his fierce solo in “Light of Day” that was unearthed in London reappeared and he had as much fun with “Rosalita” as I can remember seeing all tour.